SP-102 solar aviation light is designed to operate in remote areas. It has special ICAO compliant LED optics and in-built VLRA battery providing up to 50 hours of operations. S4GA uses a standard type of battery available everywhere. S4GA LED obstruction lights are compatible with Night Vision Goggles (NVGs): you have the option to choose visible, NVG only or visible+NVG mode. 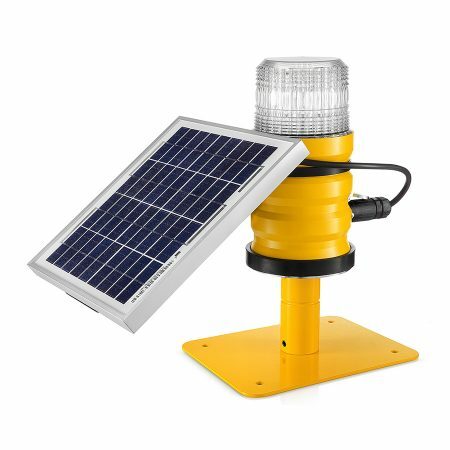 Solar obstruction lights are used at airports, wind turbines, on buildings, towers, bridges. It is applicable for obstruction and hazard marking, barricade and caution lighting. SP-102 solar obstruction light is a maintenance-free aviation lamp which works in the harsh weather conditions. Obstruction lights are equipped with 5w solar panels installed on the optimal tilt allowing to generate maximum solar energy thus charging battery faster. The body of SP-102 is made of non-corrosive aluminium, LED optics is covered by UV-resistant polycarbonate dome. Optionally, we can supply glass domes.